The core research goals for our offshore acoustic and visual surveys involve doing a multi-species cetacean survey via passive acoustic monitoring, and recording of cetacean vocalizations using a 2-element towed hydrophone array and US Navy sonobuoys. We first did this in 2005, when we set out to do real-time tracking and recording of cetacean vocalizations in deep offshore Hawaiian waters (as well as in coastal areas) off Kauai and Ni’ihau. This effort was also coordinated with visual monitoring of deep-diving marine mammals. 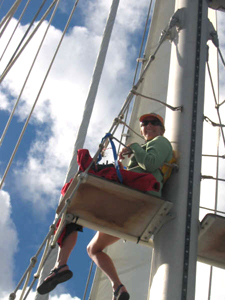 As part of our research goals, we collaborate with different institutions and organizations, and assist in the Hawaiian Islands National Marine Sanctuary and Recovery Plan goals of conservation and management through our data collection in areas where little research has been done (i.e. offshore, deeper waters, and the waters around Ni’ihau), and as we focus on species generally not seen coastally. Using the R/V Dariabar’s dual towed hydrophone array system to do real-time 3-D tracking of marine mammals. Testing a sonobuoy system for real-time locating and tracking of animals, with vertical deployment of the hydrophone array for stationary deep diving cetaceans. Photo-identification and biopsy operations for target species including those of interest to Southwest Fisheries Science Center (SWFSC) and Cascadia Research (minke whales, blue whales, fin whales, false killer whales, dwarf killer whales, pilot whales, spotted dolphins, bottlenosed dolphins, beaked whales, and sperm whales). 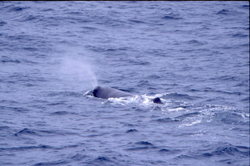 Monitoring for minke whale vocalizations (“Boings”).